Titles in BOLD are films I never seen. Teen sensation Lindsay Lohan stars as Lexy Gold, budding journalist and fashion queen of Millington Preparatory School in Manhattan. Together with her best pal Jennifer (Brenda Song), Lexy's always on the lookout for the latest scoop and the latest style. When one of her teachers mysteriously disappears, Lexy goes from school advice columnist to determined investigative reporter. And with a little help from her friends Jennifer and Gabe, and her street-smart editor Jack, Lexy vows to get to the bottom of the mystery. Before they know it, they find themselves hot on the trail of a story bigger then they could have ever imagined! While entertaining... this one is an average film...maybe a little higher. It did keep my attention easy enough but I found the mystery itself to be very predictable. Though I shouldn't be surprised by that... as the film is made for the younger crowd. Tara Adams (Debby Ryan, Disney Channel's Jessie) is just an ordinary high school junior...except for one little thing. Tara's got a secret – a secret identity, in fact; she's Radio Rebel, the most popular radio DJ in Seattle. In person, Tara is as shy as they come, but on the air, Radio Rebel is the smoothest talker around – she gives voice to all kids, popular and unpopular alike, and she questions the status quo. As Radio Rebel's popularity grows, so does the pressure to reveal her true identity. Now, Tara must choose between keeping her on-air identity a secret, or owning her voice and risk losing everything. I must say... I really enjoyed this one a lot. It has a great and fun story. It draws you in quickly and keeps your attention easily through to the end. They make it easy to cheer on the main character. This is one I definitely recommend checking out if you get the chance. Debby Ryan (Disney's The Suite Life on Deck) stars with Jean-Luc Bilodeau (Kyle XY) in this comedy about what happens when your wildest wishes come true! Abby has been dreaming about her "sweet 16" since she was a little girl...but it starts out anything but sweet. Then she receives a box of mysteriously magical birthday candles. And suddenly, Abby's every wish is instantly granted: the cherry-red sports car, the way-cool clothes, the uber-popularity at school. But when Abby makes a wish that turns her perfect new life totally upside down, she and her best friend Jay have just one chance to make things right – and to learn you have to be careful what you wish for! While an entertaining film...I have seen better. Matter of fact I like the other Debbie Ryan film in this set better then this one (Radio Rebel). The story line keeps my attention but I found I didn't care about many of the characters and found it to be very predictable. I would say it is worth the time put in to watch it... but don't expect too much. Get ready for a hilarious and heartwarming royal reality check in Princess Protection Program, the new smash-hit Disney Channel Original Movie starring Selena Gomez (Wizards of Waverly Place) and Demi Lovato (Sonny With A Chance)! Plus, this Royal B.F.F. Extended Edition DVD features an insider's look at the realities and responsibilities of being a real-life princess, and lets you listen in as real-life best friends Selena and Demi dish about their lives on and off the set! The worlds of royalty and roughing-it collide when the lovely Rosalinda (Lovato) enters the Princess Protection Program and moves in with her new "cousin" Carter (Gomez), a total tomboy. In an unexpected role reversal, "Rosie" learns how to act like an everyday girl and Carter finds her own inner princess. Once they discover what they have in common, they prove that best friends really are forever! I found this one to be a lot of fun. I enjoyed both the story line and the characters. I think the entire cast did a fine job. This one kept my attention with ease through the entire film. Well worth the time put in to watch it. Sister singing sensations Aly & AJ make their DVD debut in this all-new, hilarious Disney Channel Original Movie—Cow Belles, with an exclusive alternate ending. Super-spoiled rich girls Taylor and Courtney Callum have a lot to learn when their dad insists they take summer jobs at the family's dairy while he goes on a long-overdue vacation. While struggling to balance the pressures of popularity, crushes on totally cute boys and the pain of really growing up, will these "Cow Belles" be able to save the family business and become better people in the process? Full of hip and hilarious adventure, this all-new DVD includes a cool behind-the-scenes featurette and two Aly & AJ music vidoes. So rustle up some friends and join the fun! This one...while entertaining... is not a great one. I didn't find many of the characters likable and the story line was predictable. I felt the cast did a fine job though, the problems I have with this film is with the story itself. Over all I would say it is worth the time put in to watch it. But don't expect too much from it. The most magical event of the year is now even bigger, with more thrilling adventure! Wizards Of Waverly Place: The Movie Extended Edition features exclusive footage, behind-the-scenes bonus and awesome extras that take you deeper into the mysterious world of wizardry! Embark on a supernaturally exciting adventure as the Russos, your favorite family of wizards-in-training, join together on a quest full of heart-stopping action and hilarious magical mishaps! While on vacation, Alex (Selena Gomez) accidentally casts a spell that threatens her family's existence! Max (Jake T. Austin) tries to keep his parents together while Alex and Justin (David Henrie) use every trick they know as they search for the "Stone of Dreams" to reverse the spell and save their family. You won't want to miss one extraordinary moment of this extended, magic-filled and action-packed movie! This is from a TV series that I used to enjoy watching with my daughter. I found that this movie fit in well with the series. And it had a good story line. We both enjoyed every minute of it. If you enjoyed the series then you must see this movie as well. Winning Was Just The Beginning! Superstar Selena Gomez conjures up an adventure in Disney Channel's most eagerly anticipated, full-length special event: The Wizards Return: Alex vs. Alex. On the eve of a planned family reunion in Italy, newly crowned Family Wizard Alex Russo (Gomez) is torn between living up to her new responsibilities...and totally living it up, thanks to magic. Frustrated, Alex casts a spell to banish her selfish impulses and accidentally creates an evil doppelganger!. Now the fate of the world hangs in the balance - atop the Leaning Tower of Pisa - as "Good Alex" and "Bad Alex" fce off in the ultiamte wizard showdown. Packed with humor, suspense, and amazing special effects, this must-own event is fun for everyone! Bonus Episode: Who Will Be the Family Wizard? I like the way they did this DVD... because not only is the reunion film on this disc, but also the 2 part series finale to remind us what happened at the end of the series. As for the film itself, once again we enjoyed every minute of it. The entire Russo family returns except for one. That being older brother Justin. Once again this is a fun story for the entire family. But I recommend watching the series before watching the films. Hilary Duff stars as Kelly Collins, an artistic, fashion-minded teen who's forced to go from flashy fab to olive drab at her new stepdad's military academy in this delightful comedy. As the clumsiest, most clueless recruit ever to botch basic training, Kelly seems to be fighting an uphill battle to fit in. But it's all-out war when she butts head with Cadet Captain Stone (Christy Carlson Romano), a tough-as-nails, by-the-book "commanding officer" determined to break her spirit. See how once-carefree Kelly keeps it together amidst endless rules and regulations to win Stone's respect, and still manages to leave her own unique mark on the school. This is a film I seen several times now, It is one I really like alot.One of my favorites of the Disney Channel films. The storyline is good and they go out of their way to make sure it is not as predictable as you would expect. I liked all the characters. There was literally no one that bugged me when I saw them on the screen. Well worth the time put in to watch it. Give it a chance...it might surprise you. Go from the surf to the turf and grad some air with Johnny Kapahla: Back On Board! Catch up with everybody's favorite teen surfing and snowboarding champ, and go behind the scenes to get an inside look at the new extreme sport of dirtboarding! Johnny Kapahala returns to Hawaii to attend the wedding of his grandfather, the legendary Johnny Tsunami. But instead of catching a few waves while he's in town, Johnny's got his hands full keeping an eye on "Uncle Chris," the 12-year-old son of his grandfather's fiancée. Through Chris, Johnny is introduced to the "Dirt Devils" – the local dirtboarding team. When the Dirt Devils wind up in direct competition with Grandpa's surf shop, it's up to Johnny and Chris to join forces and save the day. Packed with bonus features that bring you into the exciting world of dirtboarding, Johnny Kapahala: Back On Board is an all-terrain adventure the whole family will love! The sequel to Johnny Tsunami. This one starts out a bit on the slow side... so the first quarter of the film I wasn't sure how much I was going to enjoy it. But as the story went on and more of the extreme sports was shown the more I got into it. Turned out it had a very good story and a lot of fun to watch. Found myself wishing I could try some of the things in this film... but I know full well at my age my body just couldn't take it... I would end up killing myself. 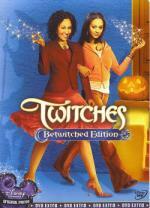 The enchanting best-selling book series comes to life in the Disney Channel Original Movie Twitches. Only the Betwitched Edition DVD has the exclusive alternate ending and a spellbinding look behind the scenes with Tia and Tamera. Superstar twin sisters Tia and Tamera Mowry (Sister, Sister) star as twin witches—"Twitches"!—who were seperated at birth. On their 21st birthday, Alex (Tia) and Camryn (Tamera) reunited and discover that their unusual powers double in strength when they work together.Get caught in their spell as they work their magic to save everyone they love and fulfill their destiny. Go twitches! This is a cute little film...though I do admit parts were a bit slow and I did feel my attention drifting from the movie at times. While they did have some... I think the sisters could have had a little more fun with their magic after discovering each other. Over-all it is worth the watch. Though not sure how often I would watch this one. Bursting with energy, a brand-new soundtrack and Double Dutch fun, the hit Disney Channel Original Movie Jump In! is now available for the first time ever on DVD—with exciting, never-before-seen bonus features that will have you jumpin'! Brooklyn teenager Izzy Daniels (Corbin Bleu of High School Musical) is training to become a boxing champ—because it's dad's dream. Yet, intrigued by the cool moves involved in Double Dutch, he agrees to help out his neighbor Mary (Keke Palmer) when she needs a fourth member on her jump rope team. The sport takes more talent and teamwork than Izzy expected, but along the way, he learns its more important to follow his own heart. 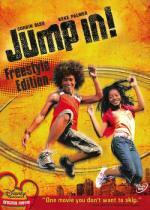 Featuring an all-star cast, amazing Double Dutch moves and the coolest music, Jump In! celebrates the power of finding and pursuing your dreams. Own all the excitement and the exclusive extras available only on this Freestyle Edition DVD. This is another one I enjoyed quite a bit. Though I do intend to enjoy films with sports in them and this one had both competitive jump rope and boxing. It has a good story and I liked all the characters. A film I just found fun to watch. Recommended. Exciting secrets are lurking in the shadows of Twitches Too, the Double Charmed Edition DVD. Join stars Tia and Tamera Mowry as they take you behind the scenes for a revealing look at the special effects tricks used in the movie – and the funny tricks played on the cast and crew – as well as a mystical alternate scene. Now that "twin witches" Alex (Tia) and Camryn (Tamera) know the truth about their royal birth, it's time for the girls to learn about each other and how to use their magical powers – with hilarious results! While Alex wants to focus on college and having a semi-normal life, Camryn is all about the "princessing" – glamour, gowns and tiaras. But their dreams must be set aside when destiny calls again. There's a new supernatural evil threatening the people of Coventry, and the girls discover that their father, Aron, may still be alive and in danger. Now it's up to the twitches to save the kingdom and their father. Twice the magic, twice the fun! you'll be doubly charmed by Twitches Too! This one I found to be just more of the same. Naturally simce they already knew about their magic there was more of them using it. Once again... not bad but nothing really special here. I would say check this one out if you enjoyed the first one. First time on DVD! In the full-length sequel The Parent Trap II, Hayley Mills returns to reprise her roles as identical twins Sharon and Susan. Now all grown up, Sharon is a single mom whose 11-year-old daughter Nikki is just as mischievous as she was! During summer school Nikki and her new friend Mary turn into scheming matchmakers when they try to get Sharon and Mary's widowed father together. Not quite able to make it happen, they turn to the one person who can really help — Sharon's twin Susan! Going by the plot for this one I will admit I was a bit concerned. But I have to say... I enjoyed every minute of it! I really enjoyed the story... and it had several laugh out loud moments for me. I was glad to see this one being Sharon and Susan grown up and getting involved with switching instead of them trying to do the same (or similar) thing with their kids this time. I also liked that they were able to get the same actress to play Sharon and Susan. I also liked that Tom Skerritt is in this movie. I have slowly become a fan of his over the last few years. It is a pleasant surprise that I liked this one almost... if not as much as the first part.